This tutorial will show you how to create a backup CD to store your computer files. Backing up files to CD is one of the easiest ways to protect your data. Most computers and laptops today come with a CD burner. This makes it easy to backup your computer without having to spend a bunch of money on extra software. You will only have to purchase the CDs. Choose between CD-R or CD-RW. So let’s start right at the beginning. What kind of CD should you use for your computer backup? There are two kinds of backup CDs. The first kind is called a CD-R. This type of CD allows you to record information onto the CD one time. Once your data has been stored on a CD-R you cannot rewrite over top of your initial backup. It’s a one-time deal. You can view the data as many times as you like, but once it’s burnt onto the CD, you can’t change it. The second kind of CD that you can use for backing up your files is called a CD-RW. The RW stands for re-writable. This type of CD can be used over and over to backup your files. It’s slightly more expensive than the CD-R type, but it’s a more economical way to backup your files in the long run. Consider the capacity of your CD. One thing you have to consider when deciding whether or not to backup your entire hard drive to CD is the capacity of the backup CDs. A CD has a storage capacity of only 700 MB. That is plenty of storage if you are just planning to backup a few files or photos. If you’re planning to backup an 80 GB hard drive to CD, then it’s going to take up approximately 117 backup CDs to complete the project. Buy CDs in bulk to save on cost. The cheapest way to buy CDs is to buy them in bulk. They come on a spindle and can be purchased in quantities of 10, 50, or 100. If you’re planning on copying a lot of files to CD, then you should probably go ahead and buy a spindle with 100 CDs. The best deal we found on blank CD-R disks was at Amazon. 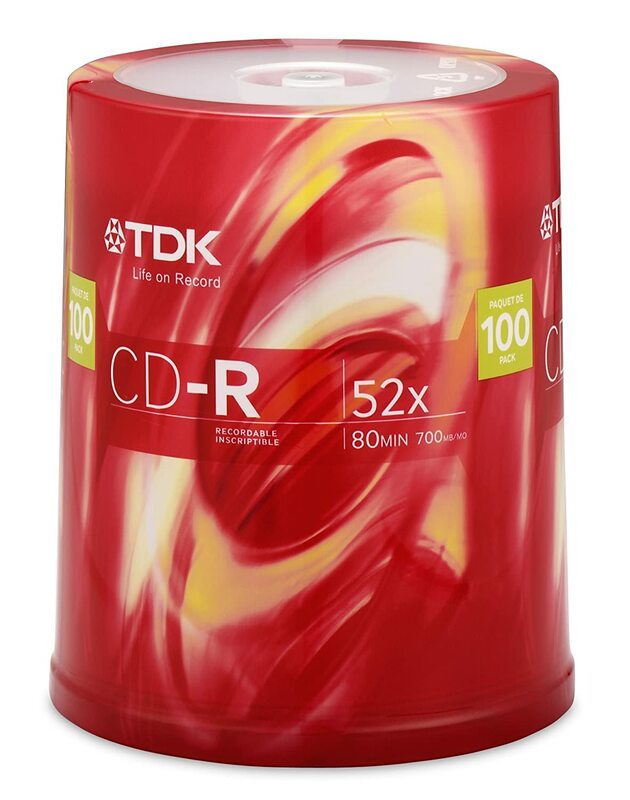 These CD-R disks are available from Amazon 100 backup disks for $27.38. 1. Insert a blank CD into your CD drive. Once the CD has been inserted into the drive, Windows will recognize it and show the following screen, which asks you, “What do you want Windows to do?” with the CD. This is the screen where you will choose which files you want to copy. In this backup tutorial we will choose the “A Diary” folder to backup to CD. You can also choose one or more files and photos or you can choose to backup entire folders. You can backup as many files and folders as you like from your hard drive to CD as long as the total size of your files does not exceed the capacity of the backup CD. Backup CDs have a capacity of 700MB. 4. To select a file to backup to CD, simply click on it and the file will be highlighted. Once the desired files or folders are highlighted, simply click on the appropriate option of “Copy file”, “Copy folder”, or “Copy selected item” that is shown in the left side panel titled “File and Folder Tasks” In our example, we clicked on Copy Folder. Depending upon the size and number of files that you have selected to back up from your hard drive to CD, the copy process could take anywhere from a few seconds to several minutes. Windows will display a status bar indicating the time remaining to complete your backup. Windows copies your files to a temporary folder where they are waiting to be transferred to the backup CD. In order to complete your backup it’s now necessary to actually burn the CD. Windows shows a dialogue box with the names of the files you wish to backup. The files are displayed under the heading Files Ready to be Written to the CD. Check to make sure that all the files that you want to burn to the CD are displayed. 7. Now under Writing Tasks, all you have to do is click on the “Write to CD” and your CD burner will go to work. Windows will open the CD Writing Wizard. Here you have the option of naming your backup CD. Follow the instructions on the Wizard by clicking the next button. Once your CD has finished, the Wizard will give you the opportunity to make an additional CD just like the one you completed. All you have to do is check the box labeled: “Yes, write these files to another CD” and stick another blank CD into your drive. If you don’t wish to create an additional backup CD, simply click on the “Finish” button. Your completed CD will automatically eject. That completes this backup tutorial. In my opinion this is definitely the clunkiest way to backup computer files. It makes much more sense to choose one of the more efficient ways to backup your computer, such as flash drive, portable hard drive, or online backup.